It’s been almost 12 years since Muhammud Yunus and Grameen Bank won the 2006 Nobel Peace Prize “for their efforts to create economic and social development from below” through microfinance. Since then what started as the revolutionary idea that a large global market exists for loans of around $20 has been both lauded for changing the world, and criticized for not alleviating poverty. Since this original conception, the scope of microfinance has changed and the majority of microlending banks now charge higher interest rates and promote larger loans. One reason for this is transaction costs, which can make issuing loans for less than $50 prohibitively expensive. This forces larger loans that many families don’t want and can’t handle, and can burden them for months or years. Larger loans also limit the types of products and product groups accessible with microfinance. In the last few years, the widespread introduction of mobile money has helped lower or eliminate transaction costs associated with typical microfinance, and has incentivized entrepreneurs to court previously underserved markets. In addition to physical goods, we now see mobile money accepted by the service sector, rent-to-own technology, and energy service platforms. This democratization of access began with solar lighting, and has expanded to LPG cooking with Envirofit’s new SmartGas service. These technology advancements allow families to pay for services they need and want on a daily or weekly basis. By allowing customers to borrow smaller sums and eschew rigid repayment schedules, the advent of nanofinance opens more possibilities for reaching the underserved than ever before. A few years back in Nepal, I visited a family who was participating in a microfinance program that offered loans for healthcare. The fund was originally setup to help make maternity care affordable. When I asked the mother what she used her loan for. She answered, “A bar of soap.” The cost? About $0.50. A loan this small was necessary for her, but isn’t worth the time and resources required for a bank to collect on and service at scale. Envirofit works in markets where goods that cost more than $10 require financing. Our durable, high-quality cookstoves range from $25 – $60, and have required partnerships with microfinance intuitions to make them affordable for emerging market consumers. Microfinance intuitions offer 6-to-12-month loans with varying interest rates based on a number of factors about the product and the borrower, and they try serve as many people as possible. Though these efforts have helped us sell 1.5 million stoves globally, there is still a large group of consumers that are difficult to reach because the existing realities of microfinance don’t work for them. The households that microfinance struggles to reach are typically families who are risk averse and have a fear of formal financing. Many of them are part of informal financing groups, but are typically tapped out on the ability to borrow more money. They prefer savings options like layaway, though these rarely convert to sales. There are difficulties on the supply side as well. If payment must be collected in-person, this requires an agent making a lengthy trip to a remote village. This arrangement understandably lends itself to inflexible, scheduled collection times out of necessity. However, if a customer’s income is variable based on weather, crop yields, resource availability, or dozens of other factors then this type of rigid repayment plan will not meet their needs. Through pay-as-you-go models, a handful of solar lighting companies have already used this platform to bring technologically advanced household products that many customers could otherwise not afford into thousands of homes in Kenya. The “loan” in this case is the lighting system itself, which is paid back as often as the household wishes to use the service. The “payment reminder” is light in the home to study and work by after sunset. Because the system is equipped with IOT technology, these companies have insights into system usage that allow them to make proactive service calls to customers which keeps use and adoption high. Inspiringly, this nanofinance model is now being adopted to create greater access to clean cooking. 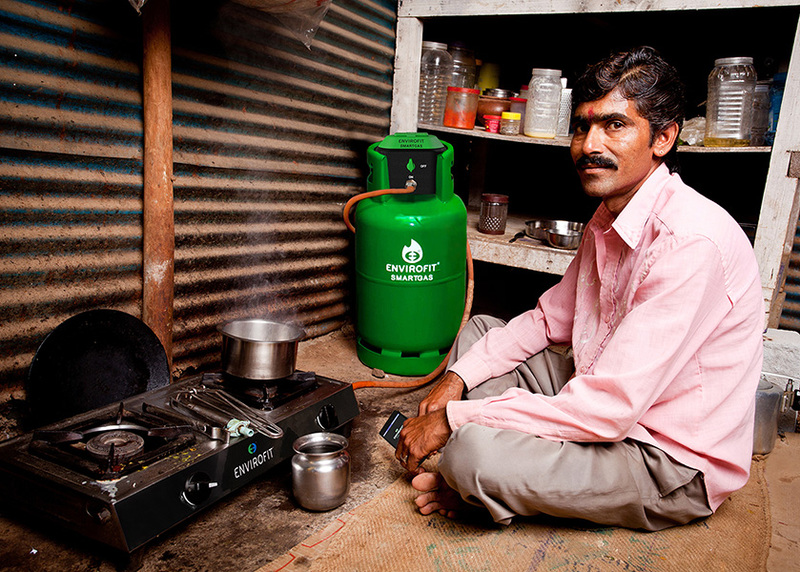 Envirofit’s new SmartGas LPG service uses nanofinance to provide pay-as-you-cook loans for LPG. Instead of the rent-to-own model used by the solar industry, SmartGas customers will lease an LPG tank that has a mobile-payment equipped flow meter, enabling flexible payments as little as $0.50 a day. Before the tank runs out of gas, Envirofit is electronically notified to deliver the next tank. Because the program is based on a continuing service model of tank delivery, Envirofit is able to add other products to the loan like LPG stoves, lights, or water filters. Nanofinance works for our customers by aligning with their consumption habits in a way that was previously impossible for businesses to sustainably offer. In short, nanofinance brings the bank to customers in low and middle-income countries. When the technology that makes it possible is coupled with a flexible service plan, it establishes a new communication channel that drives long-term adoption. Customers receive automated reminders about payments, and messages about equipment health, fuel levels and usage. And because we know that success requires more than just having great technology, we also offer continuous trainings and local peer resource groups that help customers see nanofinance services as adding value to their lives. Flexible loan options by themselves aren’t enough. For nanofinance to truly meet the needs of people, payment options must also be flexible. Lessons learned from pay-as-you-go solar have shown that income volatility is one of the largest factors of nanofinance default. Household energy services have mitigated this issue through foresight and accommodation. Service plans are designed to take income uncertainty into account, and customers who must prioritize other expenses still have the hardware available to them. When they’re ready to start using it again, a simple phone call or SMS restarts the system. Going forward it may be possible for nanofinance service platforms such pay-as-you-cook to help MFIs collect loan payments using their infrastructure and relationships. Through this service offering I predict that we will no longer see people using microfinance solutions to pay for energy products. Instead, household goods and services providers will partner with pay-as-you-go nanofinance companies to make small, flexible household loans for more products that people need and want. Nanofinance has the potential to go from servicing household energy systems to becoming a standalone finance channel. It is the next evolutionary step in sustainably serving low and middle-income households, and will help build stronger relationships with them by offering more channels for customer care and assistance. With nanofinance, social enterprises can reach more underserved markets to help more people live well.